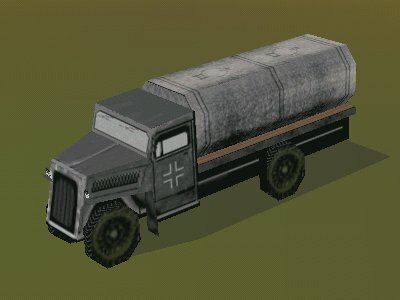 This model replaces the German fuel truck (Tmog50) in EAW 1.28a/b/c. The skin for this model has been adapted from Col.Gibbon's HR German Opel and his HR American fuel truck. This model replaces the German open truck (Tmog51) in EAW 1.28a/b/c. 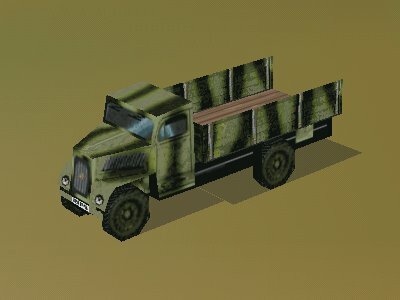 The skin for this model has been adapted from FreddyB's HR German Opel with Green camo and Shreck's German open truck. If you want to use this model in older versions of EAW you must rename the 3dz files to Tmod53 or Tmod54. Now available for download from the Ground Objects page on my site.